Well a few weeks ago I read a blog post and ONE woman’s view on visitors and guests after having a baby…it sparked a little of what my two cents are. With Emma having a baby in a month and 4 dear friends having babies in the past few weeks (welcome Simon, Finnley, Birdie and Levi). I figured I would voice my opinion on the subject as it seems to be fitting. Hospital Visits. First off everyone is different and everyone has different comforts and different needs to be met. With that said, when a friend or a relative or someone you work with or go to church with has a new baby or babies ASK THEM what they would like. Do they want visitors in the hospital? Do they want visitors a month later? What do they need? I personally love hospital visits. I enjoy friends stopping over . 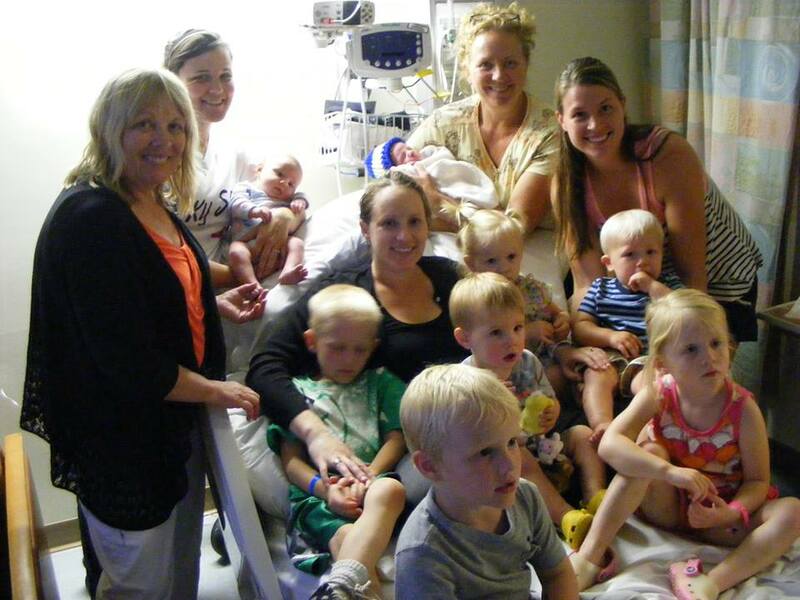 Here is a picture…Yes after my fourth, mind you, I am totally cool with utter chaos and having 8 kids, 3 grandparents and 2 aunties and 2 uncles stop by to meet Houghton. They are all family! Now with a first or a second this may be overwhelming so by all means ASK if you can bring your kids. To be honest in the hospital I love to visit friends, hold that new sweet baby and leave my kids home with my husband (unless we are related). What to Bring? One thing you may not think about unless you have had children is the hospital food. Sure mom gets a portioned meal, but after all that work something brought in maybe nice. And as for the new Daddy, he doesn’t get food. Before you come or are on your way, ASK if you can grab anything for the new parents. This is a nice gesture and is often over looked. I have learned that even on the opposite side that if I know someone is coming and driving by an Arby’s I do ask to grab something for Seth and offer to pay (Thanks Heather…who would not take money). Being vocal is key and after all visitors have left and its 11:30 pm, you don’t want to end up ordering pizza when you realize you have not eaten and are starving. Yep- we did that after our 3rd. Home? Now What? How about a meal? This new little human is a game changer…eating warm food, sleep, and what you want is all out the door. This amazing blessing is now the center of your day and meeting his/her needs takes presidence. Visitors now are awesome, especially when they come bearing a meal.Not having to think about what to make for supper for you and your husband is great, even better when you are also thinking about your other kids. I can’t express enough gratitude to all of you have have brought food when any of our kids were born! This is also a time to ASK…do they want you to stay and enjoy the meal with them? Do they want you to drop it off and leave? Again, this is a crazy time and the first few weeks are often a blur so just ASK! Its fun to have a new outfit or latest toy but in the end, at least for me it is about the support. In any which way that is given and received, it is very much appreciated! After 4 kids I definitely have started to realize I can ask for help, I can accept help and I do need it. I have called a girlfriend to grab medicine at Walgreens if she is out that day to avoid dragging my troop out in the cold. Another example is a different girlfriend calls on her way to the grocery store to ask if I need anything, I do actually have her grab me some essentials! I feel like I am “getting” life and experiencing it full circle. The phrase “do unto others and you would have done unto you” is really a great phrase and not something annoying that I thought my mom always said. So with those thoughts, just consider how you can serve someone or offer support- New baby, life change, a death, whatever it may be ..there is something said about doing something for someone else…. Have you blessed someone today?